Petunias are one of those flowers that may evoke times of yore, like Grandma’s house...and maybe even a small yawn. But then you probably haven’t really checked out the modern petunia. The reality is that they're flashy and brightly colored with endless variations of spots, picotees, and bicolor! Their all-season blast of color is incredibly reliable. Petunias are an excellent choice for the Spiller component of the “Thriller, Filler, Spiller” design aesthetic, and we'll show plenty of photos from our landscapers to prove it! Trailing petunias are the most well-known varieties as they are showstoppers in ground and in baskets. The first “Purple Wave” petunias entered the market in 1995 and were a huge hit in garden centers. Easy Wave and Tidal Wave are two popular Wave series that we carry in the nursery. We also stock a colorful selection of Proven Winners Supertunias. 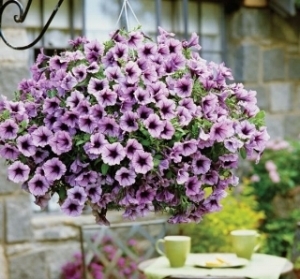 Proven Winners Supertunias are a family very long trailing petunias. This series gets 24 inches tall by 36 inches wide. Proven Winners suggests giving Supertunias a light trim in mid-summer on the longest branches or to the bottom edge of the pot/basket though not more than 20% overall. No deadheading or pinching required. Proven Winners has awarded its variety ‘Bordeaux’ (pictured at right) as the 2018 Annual of the Year and it happens to be one of our trusted favorites in the landscaping division. Easy Wave is fast-blooming, blooms freely all season without cutting back, and tolerates both heat and cooler temperatures well. This plant grows 6-12 inches tall and 36 inches wide. Tidal Wave is the largest of the Wave family and makes a great screen for unsightly spots. It will fill a very large container no problem! This plant grows 12-24 inches tall and up to 5 feet wide. This award-winning plant will amaze you with its ability to cover ground. No deadheading or pinching required! Mounding petunias are those that are bushier and compact, spreading from 1-1.5 feet wide. This is the perfect addition to an mixed annual container. Mounding types offer some of the wildest colors, ruffles, and markings. For instance, Headliner Banana Cherry Swirl picture at left is eye-catching and Night Sky has super unique starry spots. I can barely begin to describe all the fascinating colors the nursery carries. It's difficult to choose, but I love the Sweetunia series, which is technically trailing, though it's shorter and more compact at 18 inches wide. They’re incredibly floriferous and ‘Johnny Flame’ picture here is a fabulous mix of dark magenta and rose. Remember that pollinators such as bees, hummingbirds, and hawkmoths love petunias, which is yet another reason to rethink their addition in your summer garden. Trim as the summer passed to give plants a leg up for continued beauty – remove about 20% at a time. If you go on vacation and, oops, your hanging basket goes dry, move it to the shade and soak in a bucket/tub to just above the pot surface until there are no more bubbles. Petunias are resilient!